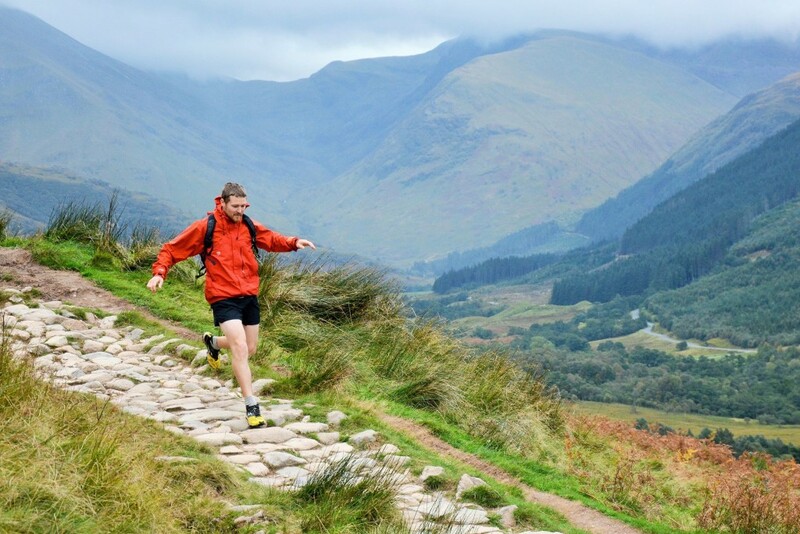 A waterproof jacket is one of the most expensive items of kit you can buy as a runner so it is worth looking after. As we approach winter, now is the time of year to give your existing kit a service. In years gone by re-waterproofing involved the use of some pretty nasty stuff – both for you and the environment. We’re always on the lookout for great products with sound ethical and environmental credentials, so we were excited when we were recently sent some waterproof washing and re-proofing products by German company Fibertec. Below I’ll be explaining the process of re-waterproofing a jacket at home and testing/reviewing the Fibertec Pro Wash and Green Guard RT products at the same time. 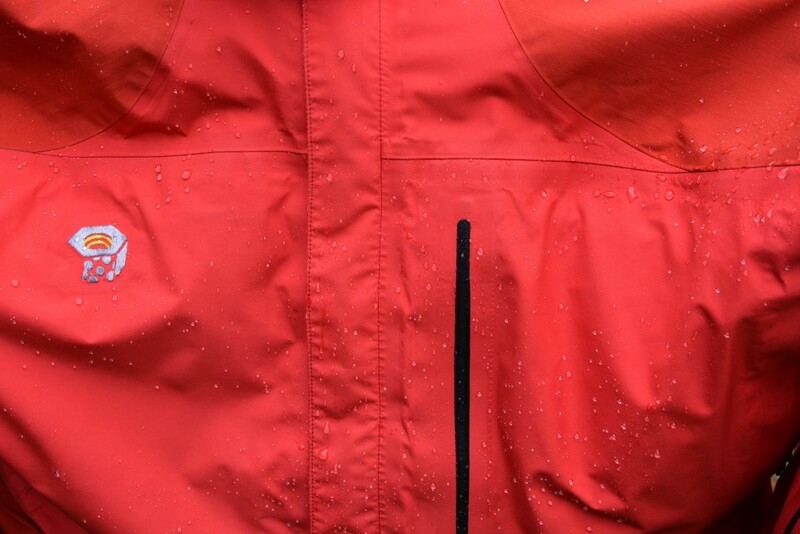 A waterproof jacket will normally have a durable water repellent (DWR) coating which makes the water ‘bead’ and run off the fabric rather than soaking in, which is known as “wetting out”. The jacket will then have a waterproof membrane such as Gore Tex and then a protective backing fabric. The membrane will stay waterproof unless torn or contaminated but if the face fabric is very dirty or wets out or the backing fabric is dirty then the breathability will be reduced and condensation will build up inside the jacket. Washing the jacket correctly will clean the face fabric and the lining fabric and it will also rejuvenate the DWR coating which should restore it to almost new performance. My old Mountain Hardwear Gore Tex jacket “wetting out”. To give a waterproof jacket the best chance of lasting well you shouldn’t wash it too often. Wash it when it is actually dirty rather than when you wash your other running kit. You probably wont need to re-proof the jacket for the first 6 months to a year of use; don’t re-proof until the face fabric starts wetting out. Washing a waterproof is easy and safe to do at home but don’t ever use a biological washing liquid/powder or fabric conditioners as it will strip off the DWR coating and can damage the waterproof membrane. You can wash the jacket by hand or in a machine. Wash it following the care label which is usually a gentle 30 degrees wash and a slow spin. You can use pure soap flakes (these can bung up a washing machine if used regularly) or a specific washing liquid designed for technical fabrics. I’ve used Fibertec products for this review but Nikwax and Grangers also make a similar product which I’ve used successfully in the past. Run the machine on an empty rinse or fast wash cycle to rinse out any residual detergent, this is particularly important if you normally use a biological washing product. Put the jacket(s) in the machine with the recommended volume of Pro Wash (35ml per item in medium water). I always use a washing bubble rather than the drawer. Wash on the recommended cycle (normally a 30 degrees gentle cycle with a slow spin). If you are not re-proofing then you can then run it on a faster spin cycle to further dry the jacket, if you are re-proofing it then you don’t need to get it out of the machine or dry it. Line dry or tumble dry if the care label allows. If you are re-proofing the jacket you need to wash it first following the guidelines above, but you don’t need to dry the jacket, you can go straight into the re-proofing process. 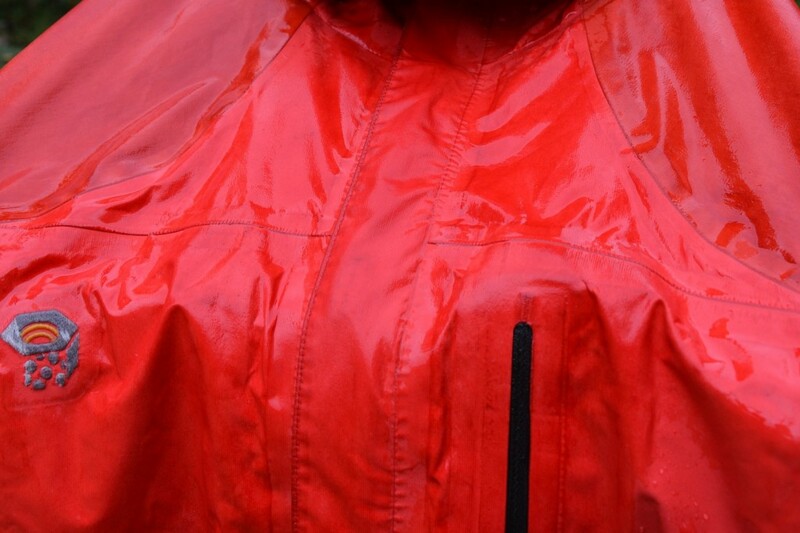 If the jacket has a drop-lining (a separate mesh liner that hangs away from but is attached inside the jacket) then a spray-on waterproofer is recommended. 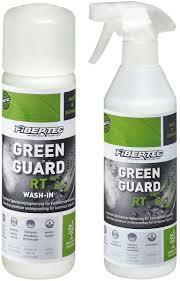 Fibertec produce Green Guard as a spray-on too. Follow the instructions on the product but basically you spray all over the fabric, leave a couple of minutes to soak in and then wipe of any excess with some kitchen paper. Add the recommended dose of Green Guard (50ml per jacket) in a wash bubble and place in the machine with the still wet jacket(s). Run the same gentle cycle again to re-proof the fabric. If the jacket’s care label allows, tumble dry on a low setting until the jacket is dry, otherwise line dry the jacket. If you don’t have access to a tumble dryer and the care label allows it you can steam iron the jacket once it is mainly dry or even use a hair dryer to add some heat. The heating at the end of the washing, re-proofing process helps the DWR reactivate as effectively as possible. Fibertec Green Guard RT will work to about 85% of its potential at room temperature and the extra 15% can be gained when heat is used. In this review I used a old Mountain Hard Wear Gore Tex XCR jacket that I’ve had and used quite a lot for about 8 years. 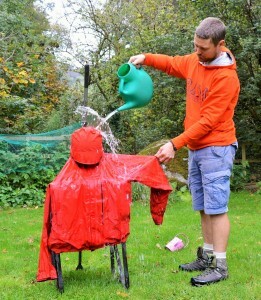 When I tested it initially it was waterproof but the shoulders and body of the jacket wetted out badly. I washed and proofed the jacket as described above, I line dried the jacket and then ironed it to add heat, I then re tested it and the whole jacket beaded up really well and didn’t wet out. The soap and the re-proofer have left the jacket smelling quite neutral but pleasant and it looks and feels clean. Fibertec produce a range of washing and re-proofing products to suit different types of outdoor clothing, footwear and gear. They are very environmentally conscious and both Pro Wash and Green Guard are Bluesign approved products. All their products are made in either Germany or the Netherlands for social and environmental reasons. I’ve used washing and re-proofing products from all of the major brands and in my opinion the Fibertec products look, feel and smell the nicest in use; it doesn’t feel like I’m pouring PVA glue on my jacket! So while I will continue to look at the other brands and try any that change I’ll be using Fibertec as my brand of choice for a while. Fibertec are an award-winning, bluesign-accredited company specialising in waterproofing technologies. 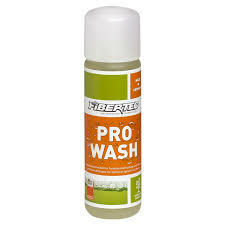 –PRO WASH (RRP £8 for 250ml) is a concentrated detergent, responsibly developed to effectively clean waterproof/breathable technical fabrics. 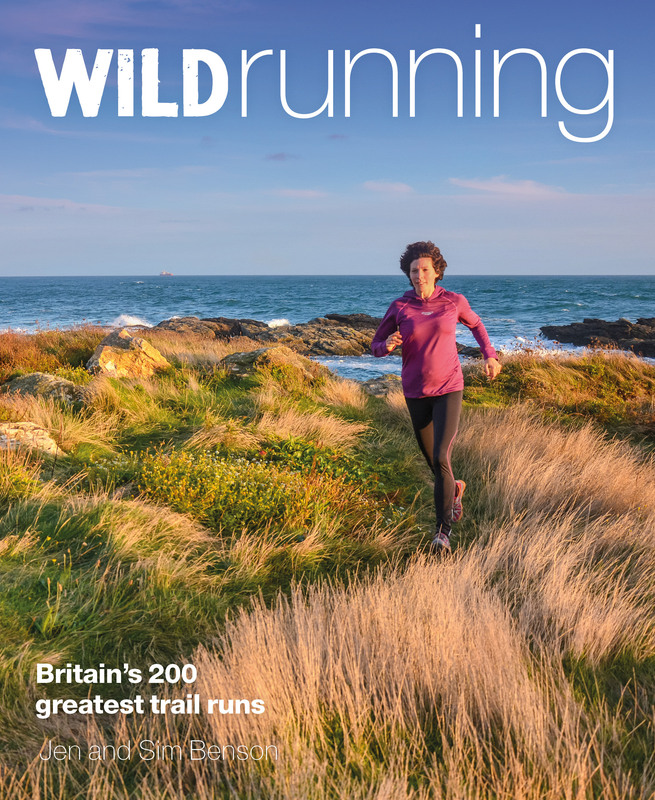 Nominated for the 2017 Running Awards!